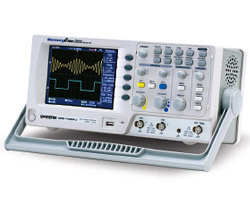 By providing the Global Lifetime Warranty Program for the GDS-1000A digital storage oscilloscope series, we believe you can have the same confidence we do in the quality of each GDS-1000A DSO. By purchasing a GDS-1000A you can be assured of a highly economical, low maintenance, quality DSO backed with the protection of the LifeTime Warranty program. The Lifetime Warranty Program guarantees customers will be supported regardless of their location. Customers will receive at least 5 years of full support even after production has ceased.